* The opposition accepts Kibaki as President. * A new post of prime minister will be created, which will be occupied by Odinga. * The prime minister will have the power to "coordinate and supervise" the government and can only be sacked by the Parliament, not the President. Kibaki had strongly resisted this. 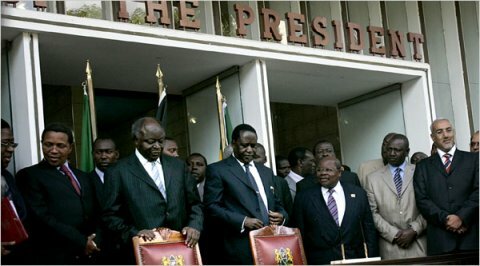 Kibaki and Odinga the moment before signing their power-sharing agreement. * Cabinet posts will be divided according to the strength of the PNU and ODM in parliament. The oppositional ODM won more seats than the PNU in the parliamentary elections, which had been held together with the presidential elections – a further sign that fraud had taken place. * Cabinet ministers can only be sacked with the consent of both the president (Kibaki) and the prime minister (Odinga). However, the peace deal did include a precise division of cabinet. Especially the post of finance minister is a crucial one that could lead to further disagreements. Two bills had to be passed, one of them a constitutional amendment, by the Kenyan parliament in order to exectute the Kenya peace deal. Among the population, the peace deal was generally greeted with enthusiasm. Thousands of people went to the streets to celebrate. But the violence, in which some 1,500 people were killed and some 600,000 fled, has left wounds in the country. And it remains to be seen whether the government can function with essentially two bosses who accused each other of ‘genocide’ only a month before reaching the Kenya peace deal.